Courtesy photo Attending a reunion and luncheon for the Claysburg-Kimmel High School class of 1965 band are (from left): seated — Judy (Claar) Lightner, Claudia (Williams) Mauk, Bonnie Garner, Donna (Crist) Parke and Donna (Claar) Weyant; back row — Gregg Wagner, Terry Malovich, Bonnie Bailey, King Bailey, Ronald Dekker, Joann Dekker, Bessie (Black) Dively, Iris (Smith) Fickes, Jean (Evans) Musselman, Richard Weyant and Bill Lightner. 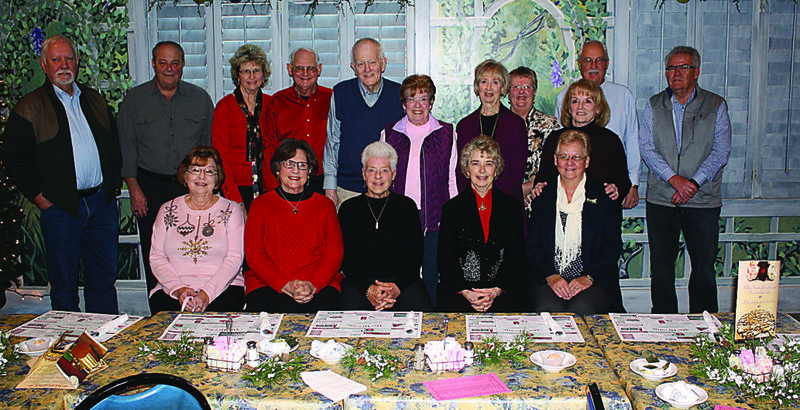 HOLLIDAYSBURG — Sixteen people who had a connection with the Clays-burg-Kimmel High School class of 1965 band held a luncheon reunion on Dec. 12 at The Dream restaurant. Joann, were among the attendees. The 1964-65 school season was the year that Green-field-Kimmel School Dis-trict had its name changed to Claysburg-Kimmel School District to give a clearer indication of where the district was located. The district is comprised of Greenfield Township in Blair County and Kimmel Township in Bedford County.